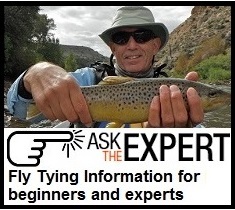 Welcome to the Angler’s Workshop Fly Recipe page. Here you will find a listing of popular flies and the ingredients that go into the making of each. Each recipe has been developed by a serious fly enthusiast or professional, and takes the guess work out of what goes into each fly. Check out the list and pick the one that you want to tie next. Check back often - more recipes are being added all the time.